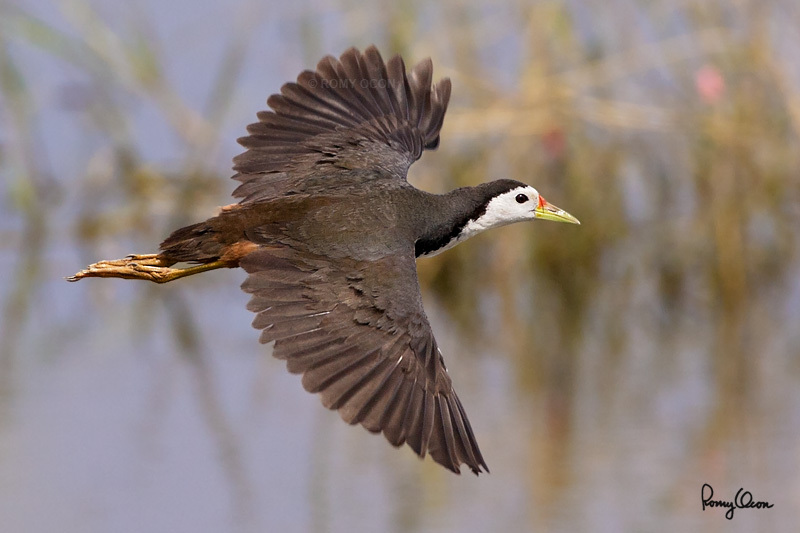 The White-breasted Waterhen is a very common bird found in all major Philippine islands. It is more conspicuous than most rails and can be found even in city parks and grassy areas. It is often seen foraging on the ground, always close to cover where it runs to when disturbed. Both male and female look alike, and it is medium large in size (11 inches total length). This bird takes to the air in short, low flights. It is not photographed often while airborne because of the tough challenge of catching it in such brief moments. I have many detailed captures of the bird while it is foraging on the ground. But this one in flight, with out-of-focus pond water and vegetation in the background, is probably my favorite because of the difficulty of capture. Habitat – Wetter areas like grasslands, marshes and mangroves. Shooting Info – Candaba wetlands, Pampanga, Philippines, July 29, 2008, Canon 1D MII + EF 500 f4 L IS + Canon 1.4x TC II, 700 mm, f/7.1, ISO 400, 1/1000 sec, manual exposure in available light, 475B tripod/ 3421 support.